A visit in the white-washed narrow streets of Kythnos is definitely a must any time of the day. Whether you're wandering through the small local shops and pantries in the morning to get the absolutely necessary for your breakfast or you're cruising by at night for the occasional drink in one of the cafes, the chora of Kythnos offers quite a pleasant walk. 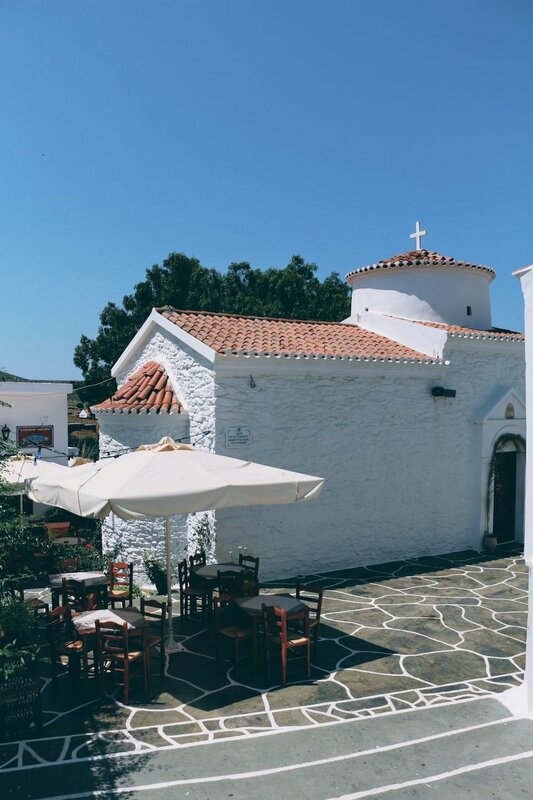 The architecture may not be the one you'll stumble upon in Sifnos or other islands of the Cycladic complex, yet there is some sort of tradition you can find of an island that has still not been flooded by the tourists and commercialised accordingly. Make sure you stop by Tratamento, where the lovely old ladies prepare the famous amygdalota, a local delicacy dessert, as well as other liquers and sweets of the sort. You can also buy some vegetables and fruit from places that seem somewhat deserted but the produce is good. There's even very good ice cream if you fancy something to sweeten your palate after your dinner. The church of St.Panteleimon is also quite the scene and behind it The Kraken is a nice stylish bar for the evening hours. If you're looking to swim, dive or sunbathe you'll have plenty of options, all good but nothing great. Despite the numerous mentions of Kolona beach as one of the best beaches in Greece, it's best if you keep your expectations low - yes, it's formation is unique and the waters are nice, but the experience is not that great getting full of boats and tourists of the sort every single day during the busy summer months. Instead, opt for the more remote and equally serene waters of Potamia, Skylos and Gaidouromantra. The are also a couple of organised beaches, Apokrisi (Coconut beach bar) and Episkopi (To Pountaki beach bar) in case you're looking for an adventure-free swim. Potamia - very remote and hard to reach through a bumpy dirt road. Crystal clear waters and very quiet; some shade also under the trees and a small hut you may want to borrow from the only house in the area! K4 - maisonettes in Kanala, Miloi and Kastellas. Take your pick!